The Digital Learning Dai.ly is Out! 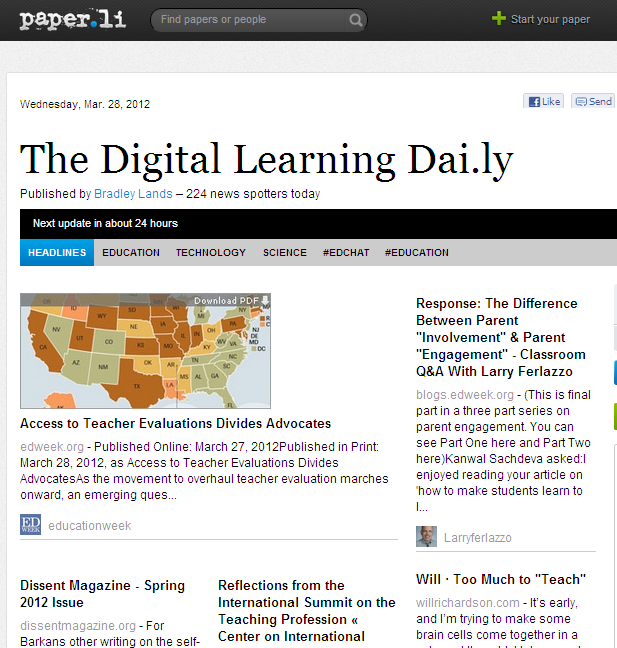 The Digital Learning Dai.ly is a digital newspaper that I created from the website http://paper.li/. Paper.li is a website that collects and aggregates Tweets from everyone I am following on Twitter, specific #hashtag conversations on Twitter such as #edtech and #edchat, and Blog Posts from different Blogs that I am following. I started this digital newspaper because it is often too difficult for me to keep up with all of the Tweets from people that I follow. Often, tweets from a particiular #hashtag conversation disappear after about a week or so. Sometimes there are so many tweets on one conversation, that it is difficult to keep track of them all. The Digital Learning Dai.ly will send out a daily, digital newspaper with the most popular tweets and blogposts from that day. 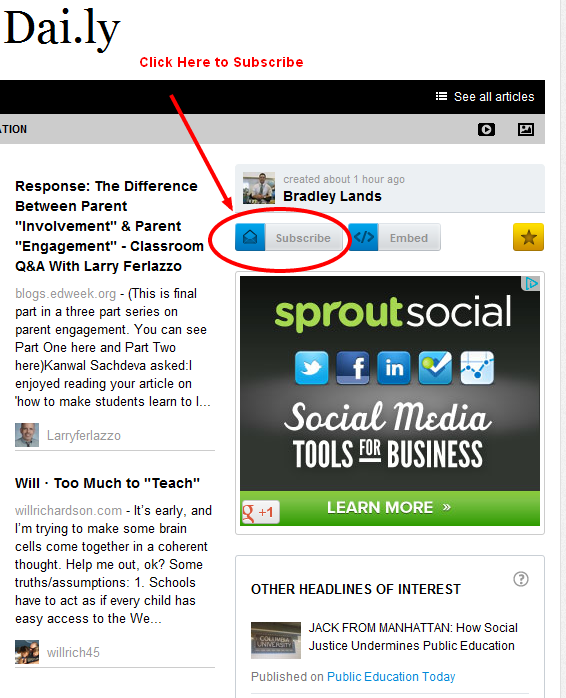 This will help to archive the most valuable tweets and blog posts for me to read at my leisure. What is the benefit of the Digital Learning Dai.ly? I have already done a lot of work by researching the best blogs to follow and the best people to follow on Twitter for education. This digital newspaper collects and sorts these resources according to different topics in education. All you have to do is simply skim through and read anything that might interest you. You can easily subscribe to the newspaper to get an email every day, or you can simply visit the website in your spare time to read up on the latest news and resources in education. Please take a few minutes to check out the newspaper. It is an amazing resource and I hope that you find it valuable! I created this digital newspaper to provide a one-stop-shop for digitally learning about education. This newspaper combines my Twitter feed, along with some of my favorite Blogs on education. My hope is that you will use this resource to keep current in the field of education and to broaden your own Personal Learning Network (PLN).